Chili with White Beans is perfect for a cozy meal to warm you to the bones! It is made with white beans – Great Northern or Cannelli Beans with just a little twist on the ‘ole Chili routine. It can be spicy if you use Baklouti Green Chili Fused Olive Oil, or family friendly if you use any of our Extra Virgin Olive Oils – which is my way of saying that it will not be too spicy for the kids. This actually freezes well also if, like me, you need a stash of something to pull from the freezer and pop into a pan frozen in a 350° oven for 30 minutes. 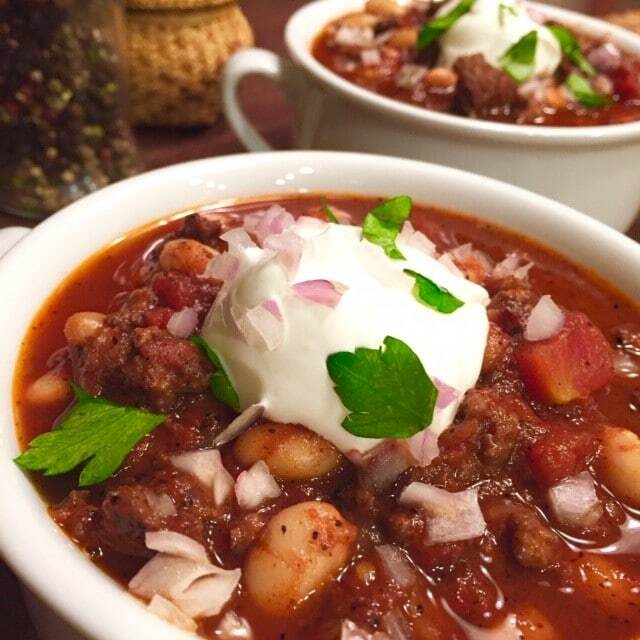 Enjoy it any weeknight, for game days or just when you are craving a little Chili. As always, we hope you enjoy this with friends and family! Chili with White Beans is mild enough for all family members to enjoy; but you may choose to make it spicy or mild based on your selection of Cultivated Tree Olive Oil you use to saute! Increase heat to medium high and add 1/2 of your meat - breaking it apart as it cooks until it is no longer pink. Push this cooked portion to the sides of the pot and repeat the process with the second half of the meat. Stir in the chili powder, bay leaves, cocoa powder, salt and cinnamon. Add tomatoes with the juice, breaking them up with a spoon. Mix in the broth and tomato sauce. Bring to a gentle boil. Reduce heat and simmer for 45 minutes - stirring occasionally. Add the beans to the chili and simmer another 10-15 minutes until the flavors blend. Remove the bay leaves and discard. Ladle into bowls - serve with the option of the toppings: red onion, cilantro and sour cream.